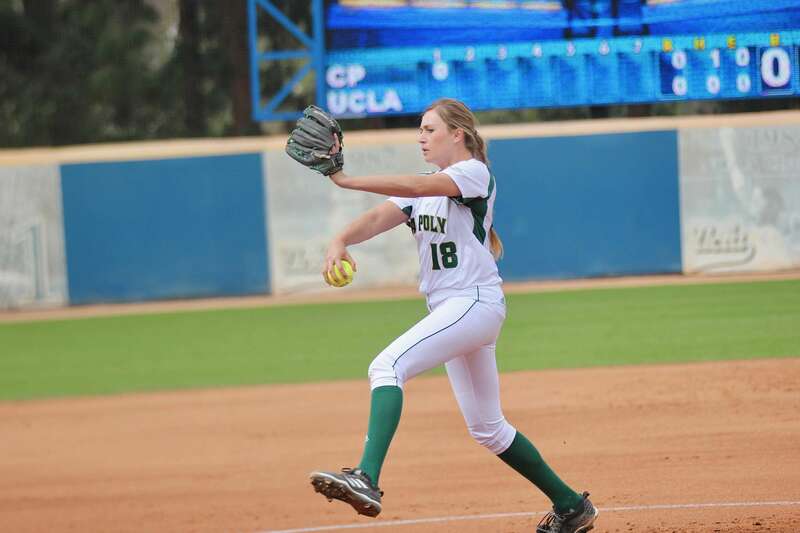 Cal Poly softball opened their season by winning three out of five games at UC Los Angeles Stacy Winsberg Memorial Tournament. The Mustangs defeated the University of Maryland twice and Middle Tennessee University, but lost both games to the No. 5 Bruins. In the opener against Maryland, senior starting pitcher Lindsey Chalmers struck out eight Terrapins in five and two-thirds innings. The Terrapins jumped out to a 3-0 lead which included a solo home run by senior Skylynne Ellazar. Sophomore first baseman Hailey Martin provided the offense for Cal Poly with an RBI single scoring sophomore infielder Alyssa McKiernan and freshman outfielder Noellah Ramos, giving the Mustangs a 3-0 lead. Martin also drove in senior infielder Chelsea Convissar for the go-ahead run to make the final score 4-3. Against Middle Tennessee, the Mustangs started strong with a 3-0 lead in the first. Senior utility player Stephanie Heyward connected on a RBI single and sophomore pitcher Shelby Jeffries hit a two-out, two-run double. Freshman pitcher Dakota Casper allowed seven hits and struck out three in five innings on the way to a Mustangs’ win against the Blue Raiders 6-1. During Saturday’s opener against UC Los Angeles, the Bruins attacked Chalmers early, scoring eight runs in the bottom of the first. Bruins sophomore Rachel Garcia and junior Zoe Shaw had run-scoring singles before freshman Briana Perez’s three-run double off of Jeffries. Cal Poly was held to just two hits and fell to UC Los Angeles 13-0. Against Maryland, Casper allowed seven hits and struck out two in five and two thirds innings. Senior center fielder Amanda Sandoval’s two-out single in the top of the sixth gave Cal Poly a 3-2 lead, but Maryland forced extra innings when a passed ball allowed sophomore Amanda Brashear to score from home to tie the game at three. In the eighth inning, junior catcher Noa Yakir’s one-out single up the middle gave Cal Poly the victory 4-3. In Sunday’s closing game against UC Los Angeles, Casper kept the Bruins to one hit in the bottom of the first, but the Bruins blew it open with a four-run second inning. Bruins junior Brianna Tautalafua started the scoring with a home run, freshman Kinsley Washington added a two-run single, and senior Kylee Perez hit a sacrifice fly. Martin’s two-run double in the fifth got the Mustangs on the scoreboard against UC Los Angeles, but that was all the scoring Cal Poly could do. The Mustangs fell to the Bruins 7-2. Cal Poly (3-2) next travels to Cathedral City, California to play in the Mary Nutter Collegiate Classic. They play Sacramento State and University of Alabama at Birmingham in their first day of the tournament Saturday, Feb. 17.